Our bakery is also brewing up Halloween favorites. Look for handmade, all-natural cookie collections from Gianna’s like Pumpkin Patch and Frosted Ghosts cookies. You can find specialty candy treats in our bakeries like Broomstick Fuel Chocolate Bars, or Frankenstein and Jack O’Lantern Lollipops. Our festive cupcakes are baked and frosted for Halloween fun; we have mini and large sizes that are great for Halloween gatherings and school parties. We are happy to put together a special Halloween cookie or cupcake platter – just ask! Or, add a special touch to homemade baked goods with Wilton’s Halloween baking pans, sprinkles, baking cups and cookie cutters. Try these recipes for more Halloween baking ideas. a spooky ambiance with our selection of Halloween candles and holders, and keep the theme going with Halloween paper plates and napkins that will ensure easy clean-up. Mollie Stone’s carries seasonal linens, plates, mugs and other decorations that you can use each year – they make great gifts, too! Each of our stores decorates for Halloween, so stop by your local Mollie Stone’s for more inspiration. Whether you’re serving light appetizers, a full meal, or skipping straight to dessert, Mollie Stone’s Catering departments make party planning stress-free. See our catering menu here, and keep in mind we love working with customers to customize the perfect menu. 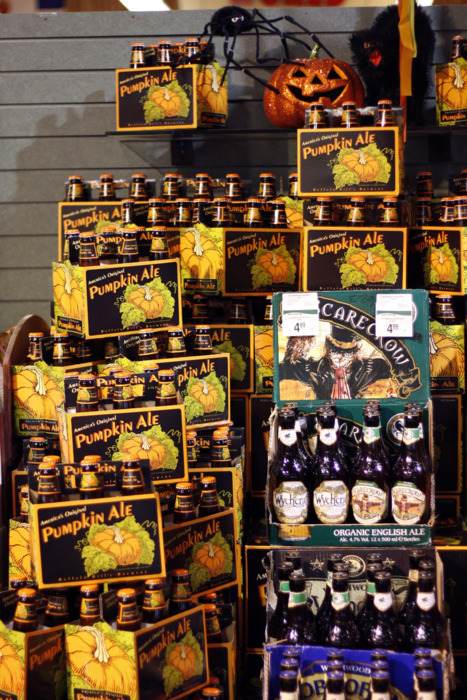 Make the night a litte more mischievous with our selection of seasonal beers and ales. From spiced beers to local hard ciders like Hornsby’s to Buffalo Bill’s Pumpkin Ale, you’re sure to find a brew that’s perfect for you!